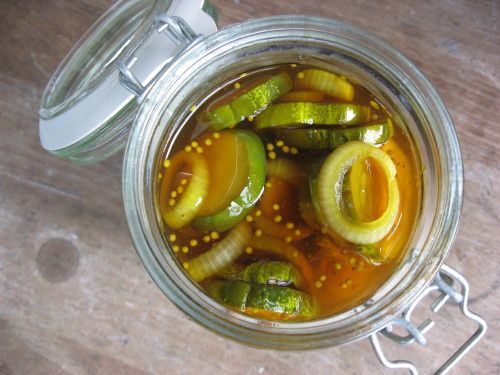 Trim a thin slice off the blossom end of the cucumbers (the side opposite the stem end) to prevent softening of the pickle. Cut the cucumbers and onions into ¼-inch thick rounds. In a non-reactive bowl, toss them with salt, cover, and refrigerate 1 to 2 hours. Drain well, rinse, drain again, and set aside. In a non-reactive pot, combine the vinegar, brown sugar, and spices, and bring to a boil over high heat, stirring occasionally to dissolve the sugar. Reduce the heat to low, simmer for 3 minutes, and then pour the hot liquid directly over the cucumbers and onions. Let cool to room temperature, then add the mixture to clean, sterilized jars. Refrigerate for at least a week before eating.